Will the BlackBerry Playbook run Android apps? | BlackBerry Blast! BlackBerry Blast! 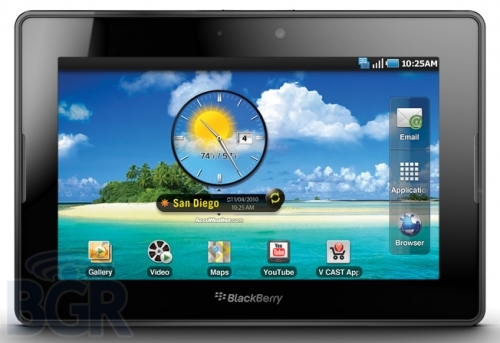 > News > Will the BlackBerry Playbook run Android apps? Some very interesting news about the BlackBerry Playbook running Android apps hit the web today. BGR is exclusively reporting that RIM might make it possible for the Playbook to run Android apps. RIM has already stated publicly that it wants to get a Java virtual machine running on the Playbook for legacy support and custom apps tat corporations have already deployed. That's where things get interesting. BGR says that RIM is considering using the Dalvik virtual machine. That's the same VM that Android uses. If RIM chooses this path it would enable the Playbook (and possibly other future BlackBerry devices) to run Android apps. This could be a really good move for RIM if they can pull it off. The market is seemingly passing RIM by but if they can get their Playbook to market and show the rest of the world what true multitasking on a tablet looks like, they have a shot to keep themselves in the game.